When it comes to technical staffing services, SimSTAFF is one of the leading staffing agencies in Sterling. With more than 40 years of experience in technical staffing service and simulation training, companies in Sterling and across Virginia turn to us for their staffing needs. Our direct industry experience enables us to find candidates that exceeded employer expectations time and time again. Once you place a request for your staffing requirements with SimSTAFF, you’ll be contacted shortly by our recruitment team so we can inquire more about the position and your goals. From that point, we’ll start searching through our database of professional candidates, reach out to our contacts within the industry, and develop a list of those we believe are most qualified. From that point, we will take the top prospects and conduct a detailed screening and assessment and connect you with the candidate that is best suited for the job. We do recognize that your business needs are changing constantly, and we work hard to meet your staffing requirements. Combining our local connection to Sterling along with our national expertise, we bring to the table, industry relationships and innovative hiring strategies to provide you with the best technical professionals. Are You Looking For Employees in Sterling, VA? If you are interested in learning more about our staffing solutions, contact us today at 407-965-2596. 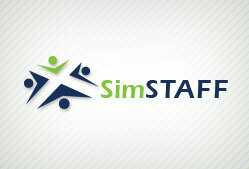 SimSTAFF is available to support your needs through a variety of staffing options, including Direct Hire, Contract-To-Hire, and large scale temporary staffing across the simulation, engineering, programming, gaming and other specialized technology fields. No other staffing agency understands you more than SimSTAFF and works harder and smarter to help you achieve success in your business. Get in touch with one of our expert recruiters today. Free resume evaluations. Send yours today.